Use our Numismatic Coin Values section to find the value of US coins in today's marketplace. 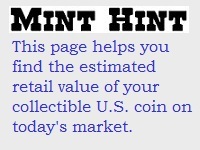 Are you searching for an estimated current value of a particular United States collectible coin? Let us help you end your search. There are numerous places on the Internet listing ballpark prices for various coins. Some of the places are accessible at no cost, while others charge a modest fee, but deliver a host of additional benefits. For a brief moment, let us here at US Coin Values Advisor toot our own horn. 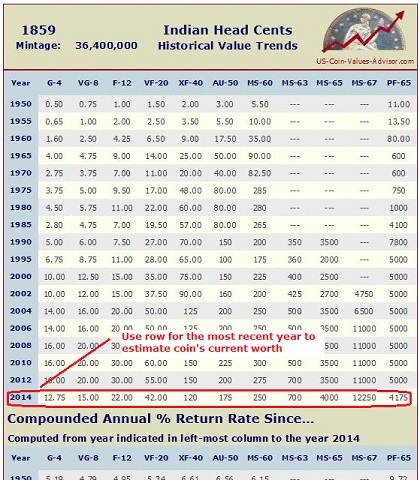 Although we specialize in providing long term pricing histories for individual US coins (something that is NOT easy to find on the Net or anywhere else -- as compared to the availability of present day price guides), collectors may still use our Coin Value Tables to get an idea of a coin's worth in today's retail numismatic market. We have Coin Value Tables online for some of the most popularly collected United States coins. The list of US coin types for which this data is ready can be found a few paragraphs below, under the heading "United States Coin Value Tables Now Available". Simply click any link to be taken to your area of interest. All information is viewable for free. Once you find the table associated with your coin's type and date, drop down to the last reported year for which values have been tracked (should be 2018 or 2019). You'll need to know the grade of your coin, but we can help you with that too. From there, you should be able to get a decent idea of what your coin is worth today at retail value. There is an image below the list of available Coin Value Tables to assist you with how to use the tables to find current values. Can't find your coin's type on our list? We know several good sites to send you. Click HERE to view our recommended coin pricing sources. The image above is a large portion of our Coin Value Table for the 1859 Indian Head Cent. Retail values for this date are tracked at various intervals from 1950 to 2014, across a spectrum of grades. Thus, a collector can use this data to see how well the 1859 cent has fared over a very long period of time, in terms of price increases. The most recent year of tracked values (usually 2018 or 2019) is a good estimator of current value. In the example above, an 1859 cent in Fine condition is reasonably ballparked at $22.00 (as of 2014... if you go to the Coin Value Table for the 1859 Indian Head Cent you'll see a more current value). Of the group above, Coin World is the only one where a numismatic researcher might find some pricing histories going back a few years on individual dates, though not nearly as far back as we have on this site, US Coin Values Advisor. What's more, none of the fine sites listed above analyze long term price trends and make key date recommendations based on past performances. That's what WE do. That is our niche. So, if you enjoy buying collectible US coins with an expectation of seeing them gaining in value as time goes on rather than flatlining, then please begin your quest on this site. The data/recommendations on some of our pages overlap, but good places to start are US Coin Types & Key Dates, Bullish US Coins, and the Rare Coin Values Index. We hope that if you leave us to chase down some present day coin values on another site, you'll return soon!